So I was playing Borderlands with my dad one day. We were about half way through the Secret Armory DLC. I was driving. Dad was in the gunner's seat. I hit a side rail just right and parked in a rather bizarre fashion. 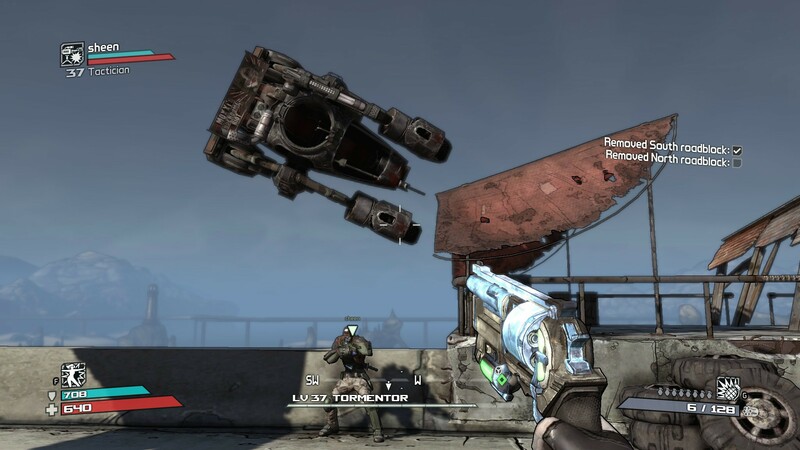 Do you guys have any funny/odd Borderlands stories? A few times NES games would start all glitchy and certain characters would be all scrambled. Taking it out and put it in sort of fixed most of that stuff though. One time I found a strange error in Link to the Past where if you saved the game after you tempered your sword and created a new game and talked to the soldiers off to the left of the castle in the start when the game was rainy the soldiers spoke all the dialog in the game. I told my cousin and he confirmed it worked for him and I sort of always wanted to send it in to Nintendo Power but never did. Guess I should have then id be rich now or something. Recently? It seems games hard lock or crash and interesting stuff like that isn't as common in my play throughs as id like.